Out of the blue, my son decided that he needed me to make him some cannoli. 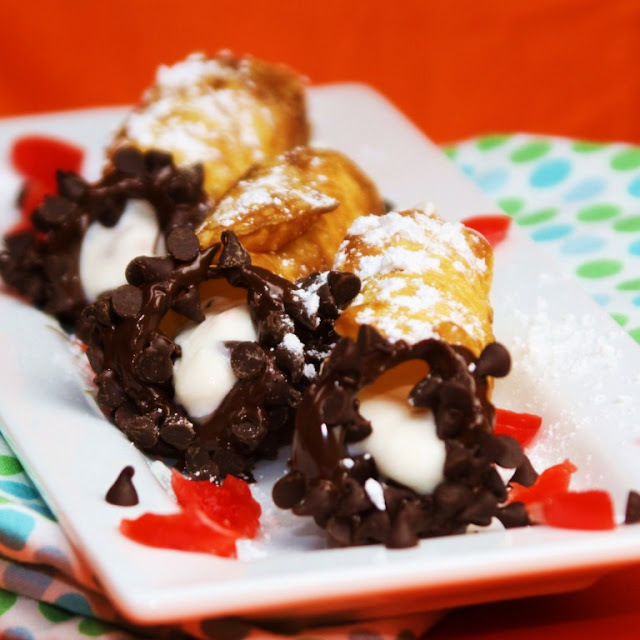 The Sicilian desserts known as Cannoli consist of tube-shaped shells of fried pastry dough that are filled with a sweet, creamy filling usually containing ricotta. Chopped pistachios, semi-sweet chocolate pieces, and candied citrus peel or cherries are often still included, dotting the open ends of the pastry. Now I should stop and explain that this is NOT a dessert that you just whip up in 30 minutes! 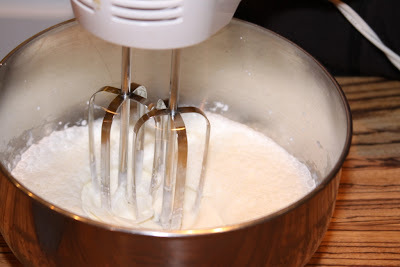 The recipe steps are quite easy, just multi-step and fairly time consuming. 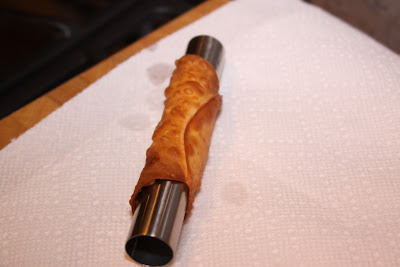 You will need to purchase some metal cannoli tube forms before you begin. 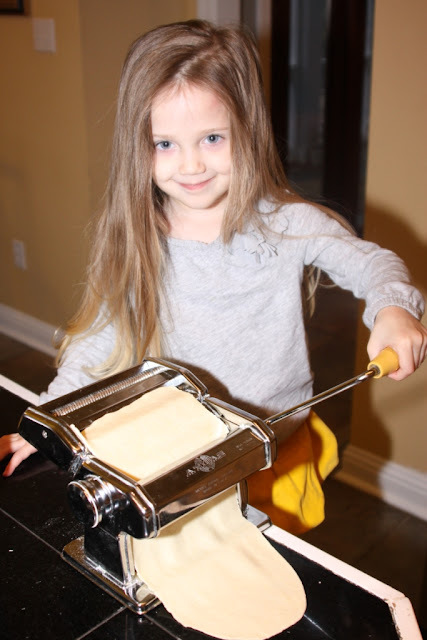 They can be found at kitchen specialty stores, and of course online. So... if you are ready for the adventure, here we go! 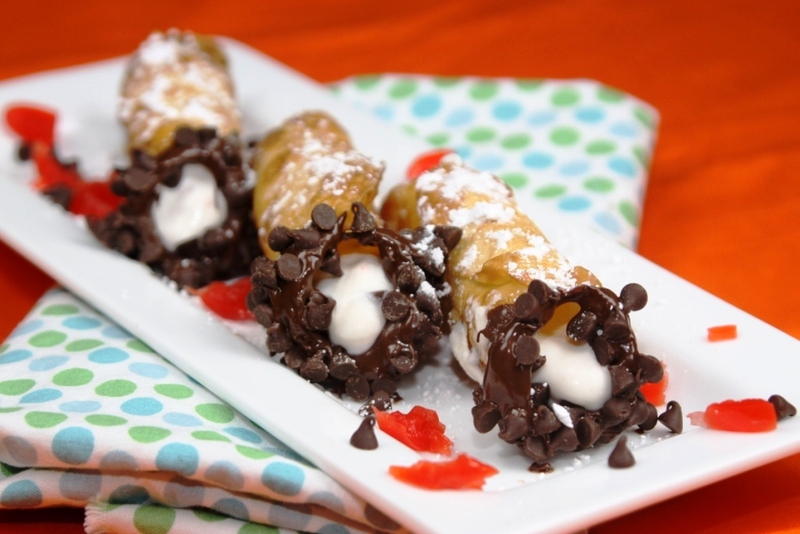 By the way, the singular for cannoli is cannolo, meaning "little tube." Probably no one calls them this, because it is pretty hard to eat just one! Please give yourself some time when starting the recipe. Note that it can be broken up into steps quite easily. You can make the shells and the filling ahead of time. Keep the shells in an airtight container in the refrigerator until you use them. (You can also make up the dough without making the shells and freeze until ready to use.) Obviously you will need to keep the filling refrigerated. 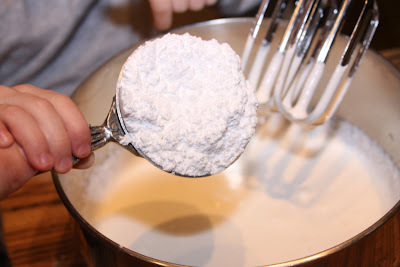 1 cup heavy whipping cream + 1 cup powdered sugar. 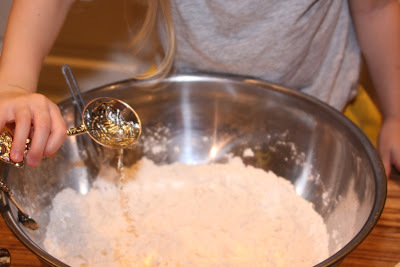 To make shells, mix flour, sugar and salt in a bowl. Add egg yolks and stir with a fork. Stir in the wine, a little at a time. 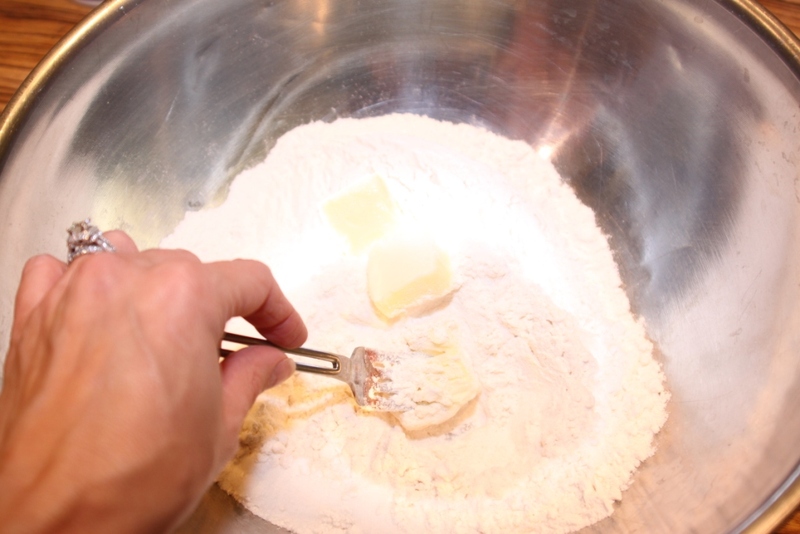 Mix with a fork until it clings together. It will look crumbly! 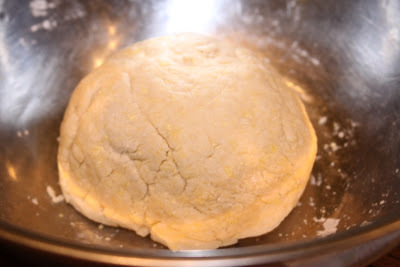 Form a ball with the dough and let is stand for at least 30 minutes. Note - it will look fairly grainy right now. 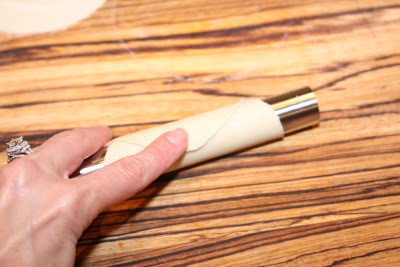 Roll the dough until it is very thin. 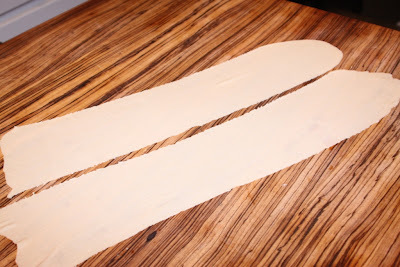 You can either do this on a well flour surface, or take the easy way out (like I did) and use your pasta roller. After passing it through successively smaller settings, a couple of times, the texture will be fine and silky smooth. 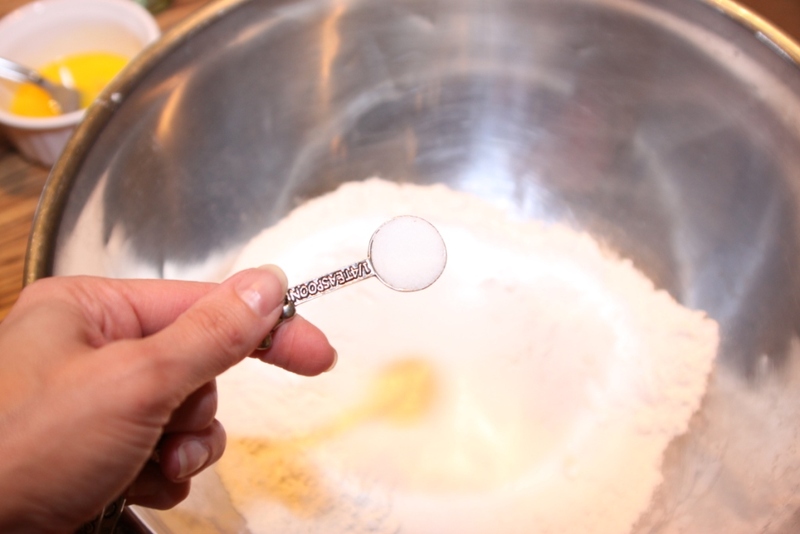 Use the rim of a large glass that is about 4 inches in diameter (like a margarita glass) to cut circles out of the dough. You could also use the clean lid of a large jar. 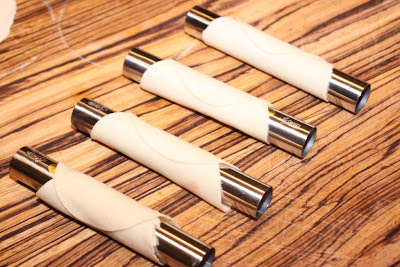 Roll each of the dough circles around a metal cannoli tube. Overlap the ends and press to seal. I also dipped my finger in water to help seal them together. You don't want them opening up during the frying process. Fry one or two at a time in hot oil (around 360 degrees F). 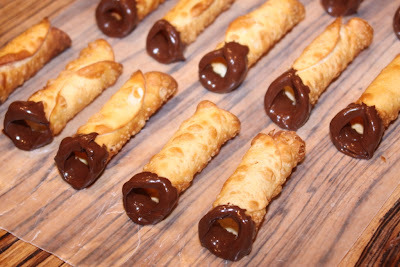 You may need to turn them with some long-handles tongs so that they brown evenly. I only left them about 45 seconds (maybe) to get the brown color I wanted. Keep your candy thermometer on the edge of the pot to keep an eye on your oil temperature. 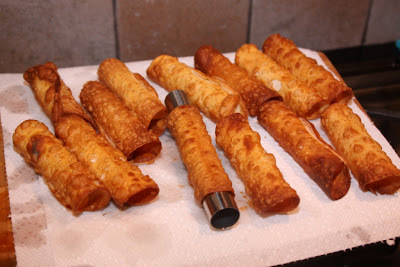 Allow them to drain on paper towels for a couple of minutes, then remove the tube from the pastry. I held the shell in one hand with a paper towel, and pulled the tube out with a pot holder because those metal tubes are HOT! 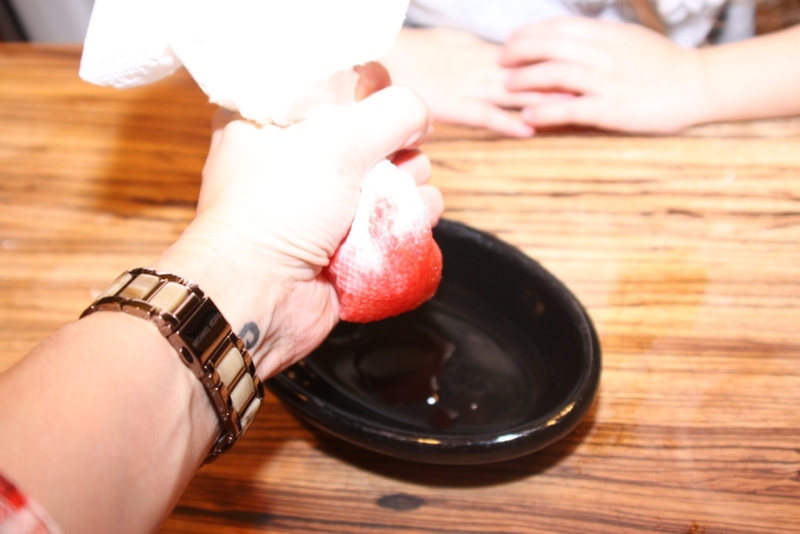 Squeeze the maraschino cherries with a paper towel or clean kitchen towel to remove all the liquid. Drain ricotta cheese over cheesecloth if ricotta is watery. Combine ricotta, powdered sugar, and vanilla extract. 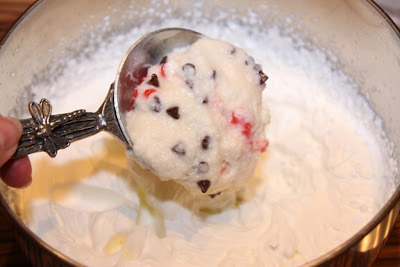 Stir in the cherries and chocolate chips into the ricotta mixture. Do not over mix it. 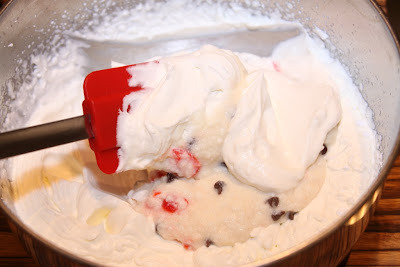 In a very cold metal bowl, whip 1 cup of heavy whipping cream to form stiff peaks. Fold in 1 cup of the ricotta mixture at this point. Gently! .... and I think I added some additional chocolate chips. Hey - it's YOUR food. Do with it what you want! Yeah, I know. Don't shake your head at me! To make the shells a little fancier, I melted some of the semi-sweet chocolate chips over a make-shift double boiler (a pan placed over simmering water in the bottom pot). Make sure to stir often to melt the chips. 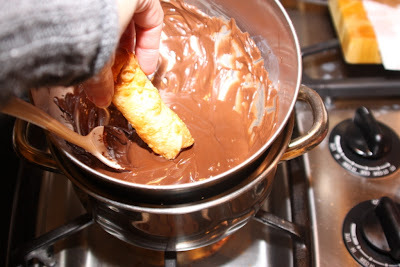 Dip one of the open ends of a cannoli shell into the melted chocolate. Set them on waxed paper. Over a small bowl, I sprinkled the still-wet chocolate with mini chocolate chips. Let them "dry" on the wax paper. Fill the cooled shells with the cold filling. 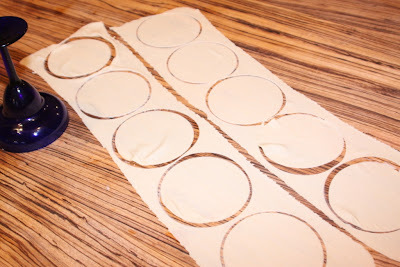 Use a pastry bag, or something to that effect. A zip-top bag with the corner snipped off of it will work just fine. Garnish as you wish. I sprinkled powdered sugar on top, and a few additional chocolate chips and cherry pieces around the plate for color. Drain ricotta cheese over cheesecloth if ricotta is watery. 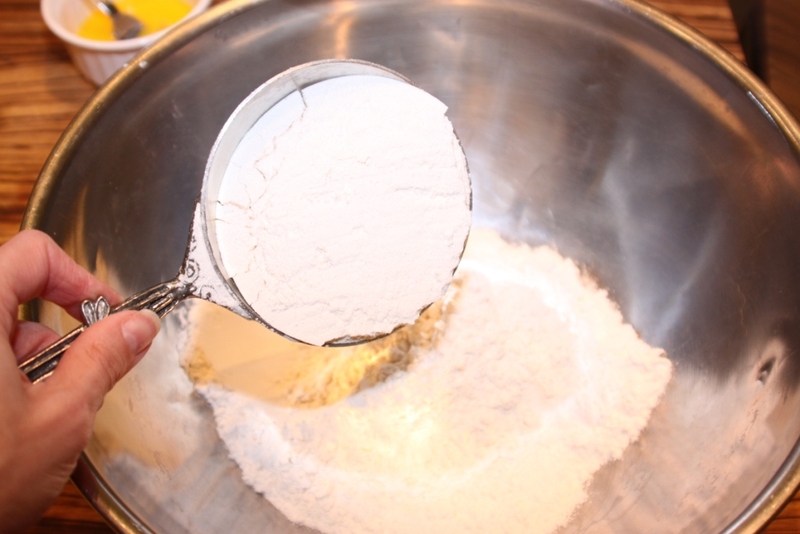 Combine ricotta, powdered sugar, and vanilla extract. Stir in the cherries and chocolate chips into the ricotta mixture. Do not over mix it. In a very cold metal bowl, whip 1 cup of heavy whipping cream to form stiff peaks. Fold in 1 cup of the ricotta mixture at this point. Gently! 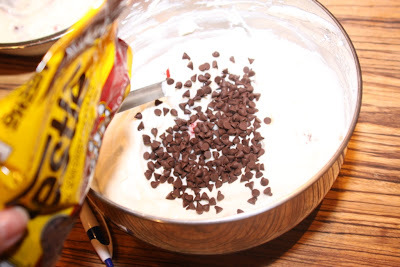 .... and I think I added some additional chocolate chips. Hey - it's YOUR food. Do with it what you want! 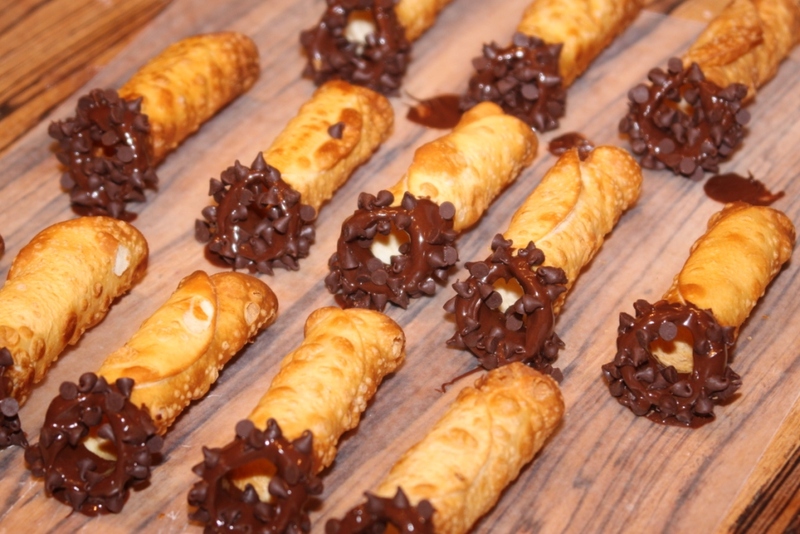 Chill the filling for at least 30 minutes to let it get stiffer again before piping into the cooled cannoli shells. 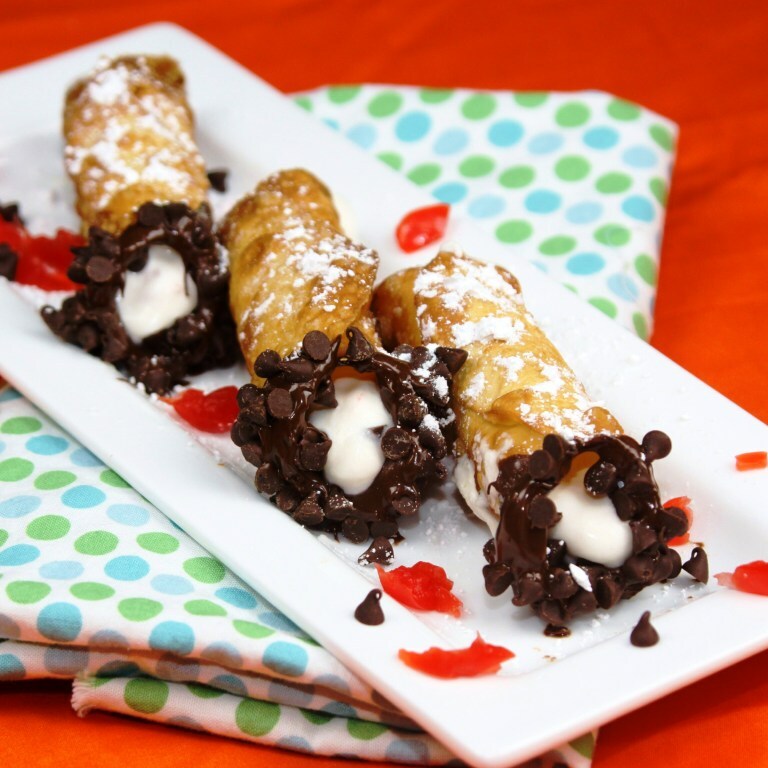 Keep the cannoli refrigerated until you serve them. To make shells, mix flour, sugar and salt in a bowl. Cut in butter. Add egg yolks and stir with a fork. Form a ball with the dough and let is stand for at least 30 minutes. Roll the dough until it is very thin. You can either do this on a well flour surface, or take the easy way out (like I did) and use your pasta roller. 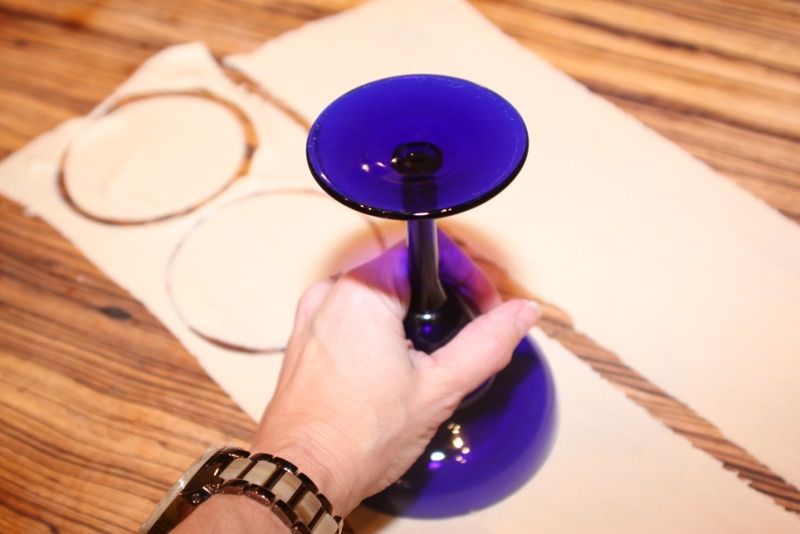 Use the rim of a large glass that is about 4 inches in diameter (like a margarita glass) to cut circles out of the dough. You could also use the clean lid of a large jar. Roll each of the dough circles around a metal cannoli tube. 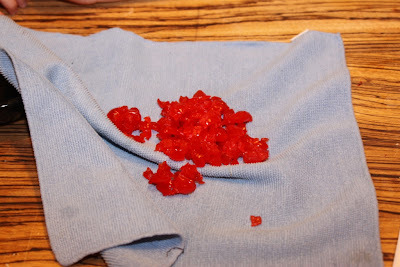 Overlap the ends and press to seal. I also dipped my finger in water to help seal them together. You don't want them opening up during the frying process. 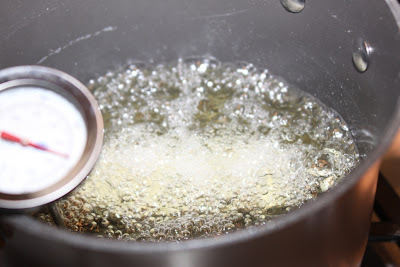 Fry one or two at a time in hot oil (around 360 degrees F). You may need to turn them with some long-handles tongs so that they brown evenly. I only left them about 45 seconds (maybe) to get the brown color I wanted. Keep your candy thermometer on the edge of the pot to keep an eye on your oil temperature. Allow them to drain on paper towels for a couple of minutes, then remove the tube from the pastry. 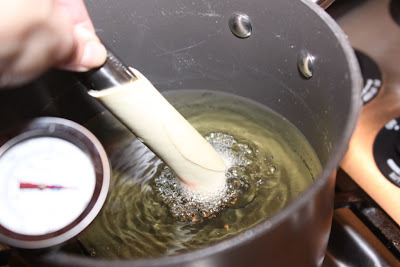 I held the shell in one hand with a paper towel, and pulled the tube out with a pot holder because those metal tubes are HOT! The filling - Squeeze the maraschino cherries with a paper towel or clean kitchen towel to remove all the liquid. Drain ricotta cheese over cheesecloth if ricotta is watery. Combine ricotta, powdered sugar, and vanilla extract. 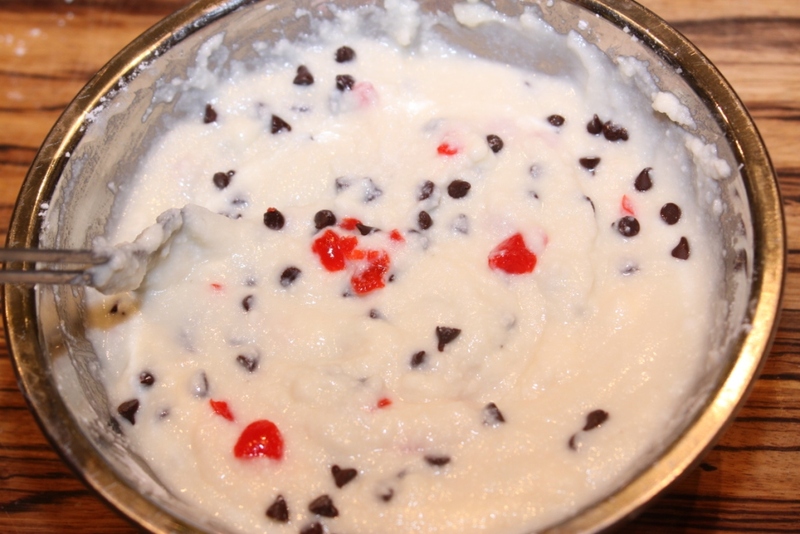 Stir in the cherries and chocolate chips into the ricotta mixture. Do not over mix it. In a very cold metal bowl, whip 1 cup of heavy whipping cream to form stiff peaks. Fold in 1 cup of the ricotta mixture at this point. Gently! Assemble -To make the shells a little fancier, I melted some of the semi-sweet chocolate chips over a make-shift double boiler (a pan placed over simmering water in the bottom pot). Make sure to stir often to melt the chips. 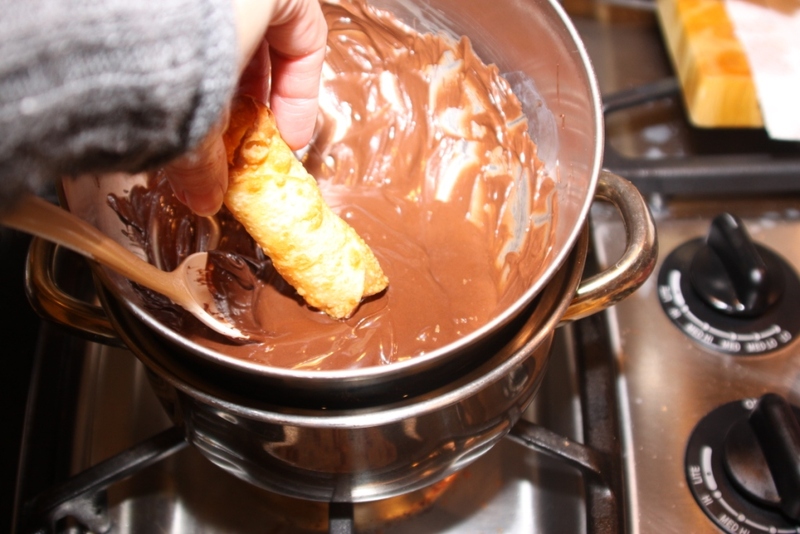 Dip one of the open ends of a cannoli shell into the melted chocolate. Set them on waxed paper. Fill the cooled shells with the cold filling. 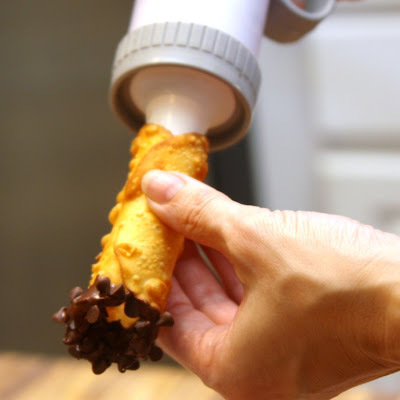 Use a pastry bag, or something to that effect. A zip-top bag with the corner snipped off of it will work just fine. Garnish as you wish. I sprinkled powdered sugar on top, and a few additional chocolate chips and cherry pieces around the plate for color. 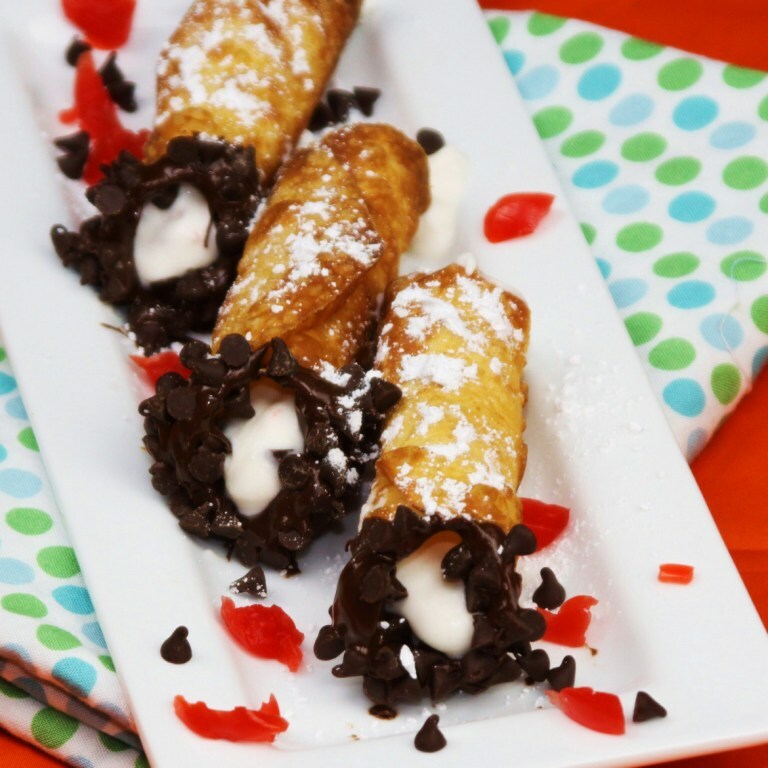 Want more delicious dessert options? 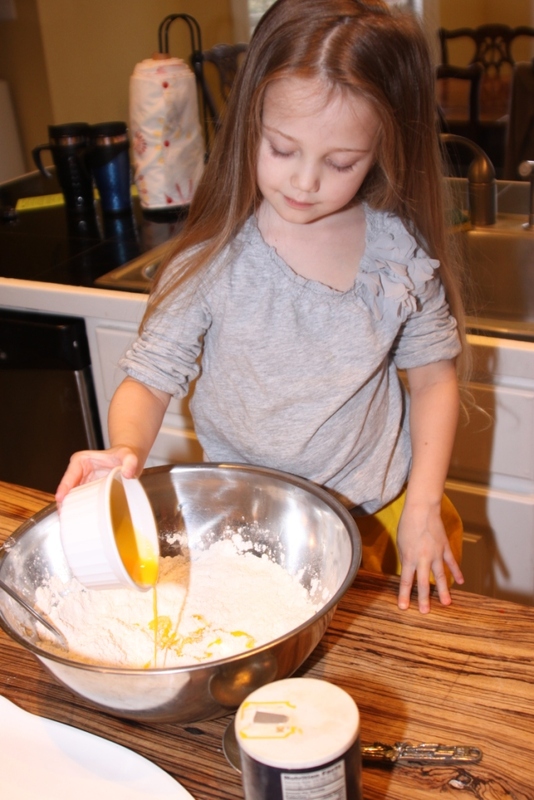 Check out my Recipe Index for some great ideas! 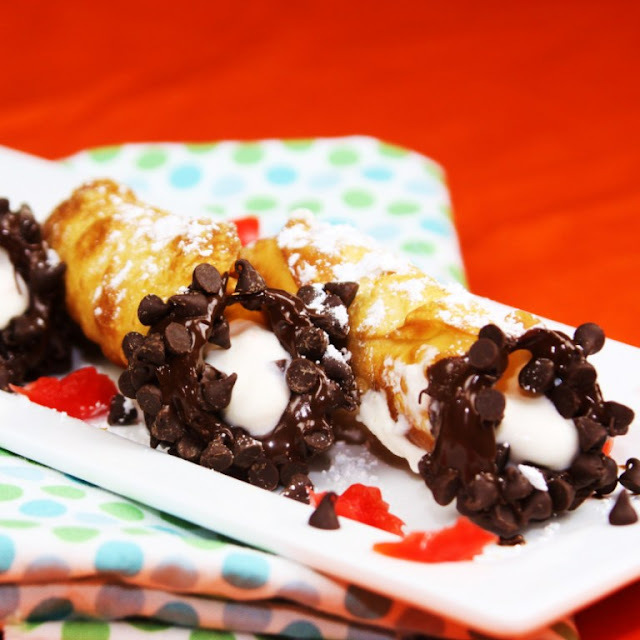 Some of them are made from scratch, like the cannoli, where others make use of convenience items for the novice cook, or the busy mom!